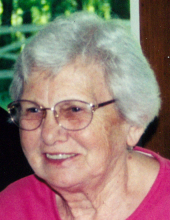 Ruth Eleanor Reed, 95 of Lodi, Ohio passed away Saturday, February 9, 2019 at the Inn at CoalRidge in Wadsworth. She was born April 29, 1923 in Tallahassee, FL to Henry and Bernice (Frey) Fosnight. Her family moved to Medina County when she was a young child and she spent most of her life in Lodi. Ruth was a 1941 graduate of Lodi H.S. In 1950 she married Carl Reed and began raising their family. She was a former member of the Homerville Chapter of the Order of Eastern Star and the Lodi Fire Jets. She was preceded in death by her husband Carl, son Robert, brothers Russell, Jay and Charles Fosnight, and sisters, Thelma Baker, Mary Waltz, and Genevieve Vellenoweth. Visitation will be Tuesday, February 12, from 4:00 to 6:00 PM at Parker Funeral Home, 210 Medina St. Lodi (330-948-1122) where the funeral service will be Wednesday at 11:00 AM. Pastor Beryl Baum will officiate. Memorial contributions may be made to West Salem United Methodist Church, 80 E Buckeye St. West Salem, OH 44287. Online condolence may be shared at www.parkerfuneralhomes.com . "Email Address" would like to share the life celebration of Ruth E. Reed. Click on the "link" to go to share a favorite memory or leave a condolence message for the family.